A Gothic art masterpiece and the coronation site of the Kings of France, it has been listed as a UNESCO World Heritage Site since 1991. The Mecca for tourists in the Champagne region welcomes 1,500,000 visitors every year. By size, Reims Cathedral is quite an extraordinary construction: designed to accommodate huge crowds, its gigantic dimensions include a surface area of 6,650 m2 and a length of 122m. Erected between 1211 and 1516, according to an architectural program of great artistic richness, Reims Cathedral features amongst the most beautiful examples of Gothic art still standing. 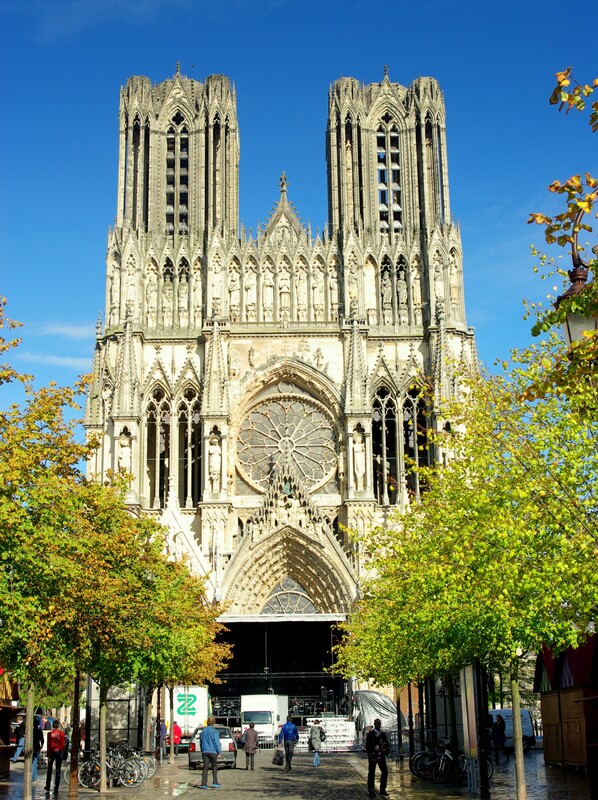 Reims has been a major city since Gallic times, first as the main city of the Remi, a Gallic tribe, but since the Classical Antiquity, it had become the capital of the Belgium province, a vast territory covering the whole north of Gaul at the time. In 401, the first cathedral Notre Dame de Reims was erected on the site of ancient thermae by St. Nicaise (who later suffered martyrdom and died decapitated). When the Roman Empire collapsed, the Bishop of Reims naturally benefited from this influential situation and began to enjoy a continuously increasing prestige, positioning himself as the official upholder of public authority. During the Middle Ages, Reims was an eminent religious centre organised around its cathedral and three great abbeys: Saint-Remi, Saint-Nicaise and Saint-Denis. In the 8th century, the Bishop of Reims took the title of Archbishop before becoming the count of the region as early as 1023, making him Lord Magistrate with control over high and low justice. The Archbishop of Reims had authority on a vast territory located in the North of France, comprising the bishoprics of Châlons, Soissons, Senlis, Noyon, Laon, Amiens, Cambrai, Arras, Thérouanne and Tournai (present-day Belgium). A Carolingian cathedral was built in 820 and consecrated in 862, in the presence of Charles the Bald. 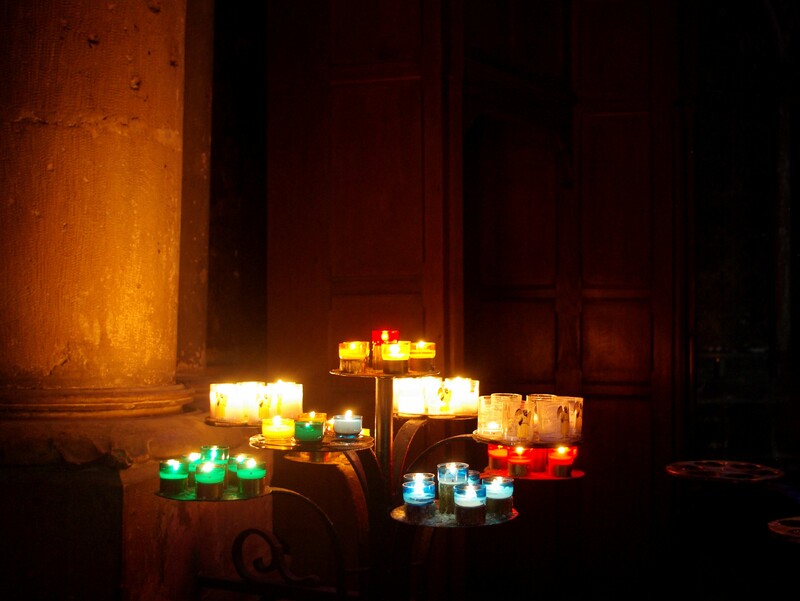 In the 11th century, the 8th century crypt was rediscovered and consecrated to Saint Remi. The former cathedral burnt down with a large part of the city on May 6, 1210. A year later, the Archbishop Aubry de Humbert ordered the construction of new walls of the current Gothic building above the foundations. 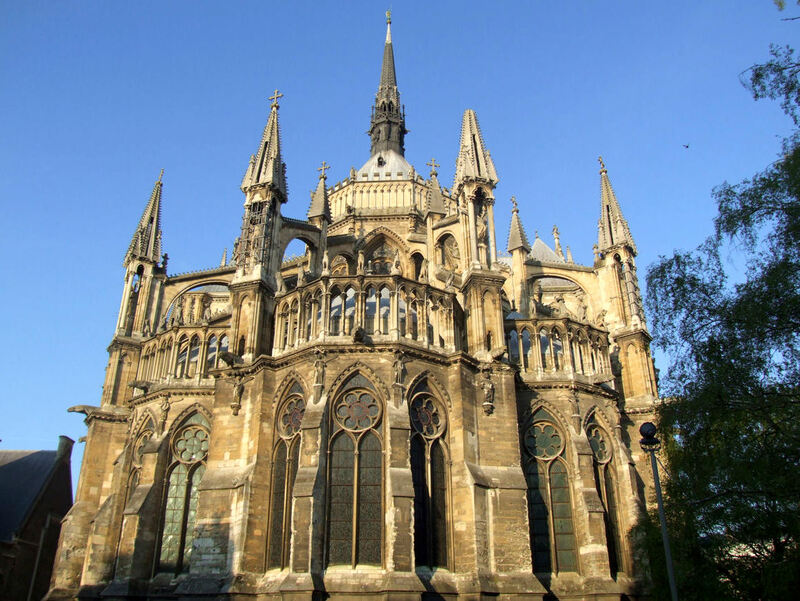 Due to major investments and donations, the construction site for the cathedral was carried out with such rapidity that at the end of ten years, around 1220-1221, the Rayonnant chapels and the ambulatory access to the chapels were operating. On the other hand, the chancel, transept and double aisles were partially being completed. During the following decade, from 1220 to 1233, work continued at a frantic rhythm: the walls of the transept aisle’s west side and the aisles of the nave were then built on five eastern bays, protecting the old narrower nave, where church services could still be held in 1228. The archbishop looked for financial means to support the incredible construction site. Collectors of alms were sent in suffragan dioceses in order to seek donations in exchange of letters of indulgence. Similarly, properties of the chapter were put for sale. However, from 1233, the people of Reims began to protest against the cost of the operation associated with the work. They were not the only ones to express their dissatisfaction: the suffragan bishops, particularly the Bishop of Laon, also protested against the forced collections of funds. Due to the danger of such revolts, the chapter had to abandon the city for more than two years. Thus the construction site clearly slowed down in 1233-1236 and the joint authority of the Pope Gregory IX and King Louis IX was required to ease people’s minds. It seemed that the choir and the transept were completed after the chapter’s return to Reims. However it was believed that the revolt of the people of Reims and serious work disruptions were able to suspend the construction of typical Gothic parts of the period: implementing double aisles in the nave (a logical solution to the layout of the choir and transept), installing side chapels in the buttresses of the nave and abandoning the construction of the two spires of the towers, as well as the initial gigantic project which planned the construction of seven spires. Around 1245, the new western façade was placed at more than twenty metres beyond the old one and in 1252, the portals were mounted up to the height of the gables. As for the two towers, they were erected in the first half of the 15th century. On July 24, 1481, the roof caught fire and repairs lasted for 9 years. The last stone was laid down in 1515 but the cathedral suffered several damages, due to forces of nature and political events. In Easter 1580, a storm destroyed the great rose window of the south transept and in 1712, the angel of the bell tower was in turn knocked over by a howling wind (it was restored in the same year). In 1744, as in many French cathedrals, the rood screen was destroyed along with the choir walls. The famous labyrinth was removed in 1778. 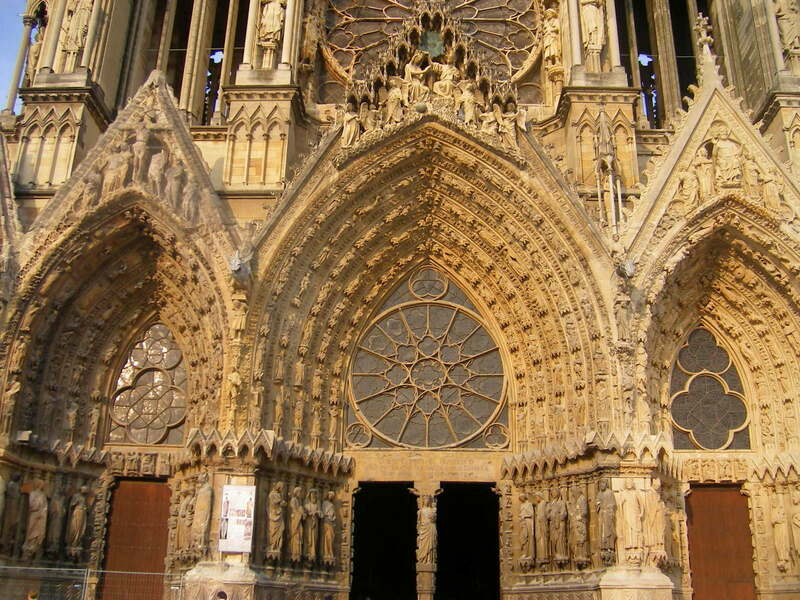 During the French Revolution, Notre-Dame de Reims was transformed in a fodder store. The ridge cresting decorated with fleur-de-lys and clovers was removed because it evoked symbols of the Ancien Régime. The same was done for the fleur-de-lys of the apse gallery inside the cathedral. The canopy above the Virgin on the central portal’s trumeau was destroyed with its pyramid and the 13th century sculptures of the lintel were removed and replaced with a revolutionary inscription. 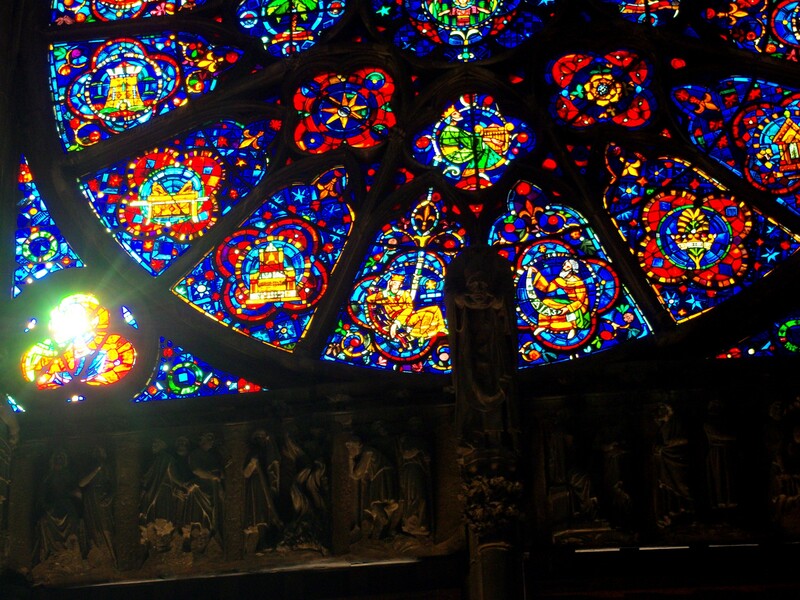 However, the upheavals of the Revolution did not reach the extent of the damage noticed elsewhere such as in Chartres Cathedral or Notre-Dame de Paris. In the 19th century, the campaign to protect Gothic architecture in France, instigated by Victor Hugo through his novel “The Hunchback of Notre-Dame”, led to restorations, replacements and new creations. 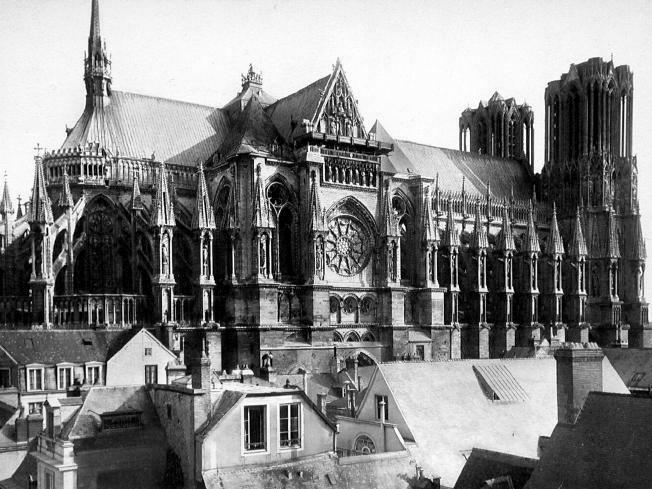 In 1860, the French architect Eugène Viollet-le-Duc directed the restoration work of Reims Cathedral, essentially focusing on the high galleries of the nave and the apse, the great rose window and the towers. The First World War did not spare Reims Cathedral, which was seriously damaged by 25 German shells on September 19, 1914. 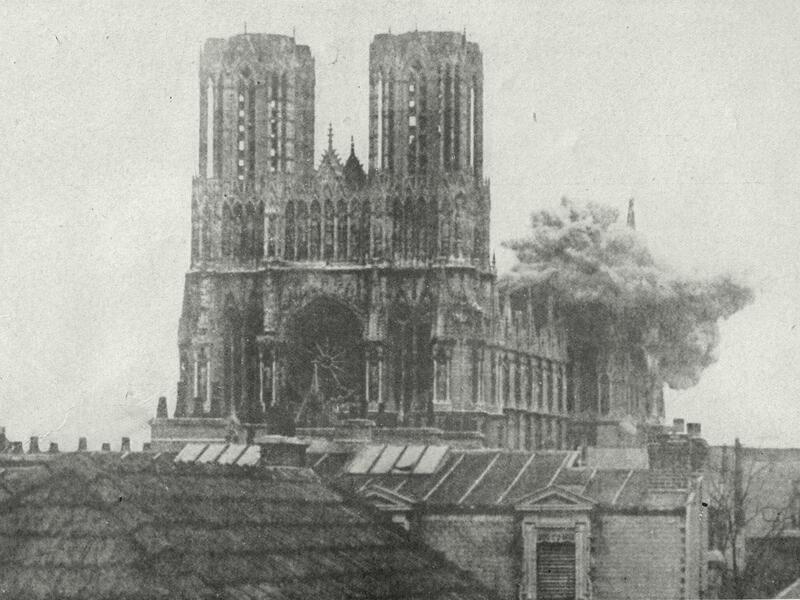 Reims and its “Martyred Cathedral” became the symbol of German destructions during the Great War. The partial destruction of the monument led to a strong wave of emotions across the country. Several injured German prisoners who found refuge in the cathedral were killed by outrage. In 1919, President Wilson and his wife visited the cathedral in ruins. In 1924, Reims Cathedral, the palaces of Fontainebleau and Versailles received a million dollar donation from the wealthy American John D. Rockfeller, for the restoration of these famous monuments of French heritage. It was during the 1924-1926 restoration work that was restored the ridge cresting of the roofing decorated with alternating clovers and fleur-de-lys and which was destroyed in the Revolution. On July 8, 1962, President Charles de Gaulle and Chancellor Konrad Adenauer celebrated the Franco-German reconciliation in the presence of Mgr Marty, Archbishop of Reims. In 1991, Reims Cathedral is consecrated: it features on the prestigious UNESCO World Heritage List. In 1996, Pope John Paul II visited the cathedral on the 1500th anniversary of the baptism of Clovis by Saint Remi. In 2011, Reims Cathedral celebrated its 800th anniversary. 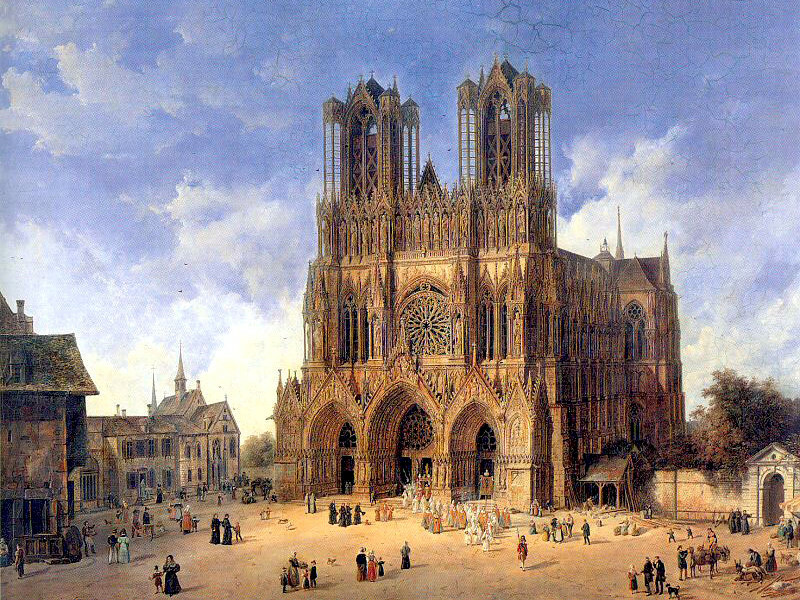 In 498-499, the baptism of Clovis by Saint Remi was the founding act of the Royal Anointing in Reims Cathedral. However, the first king to be crowned was Pepin the Short at Soissons in 751, then again at Saint Denis in 754 by Pope Stephen II. 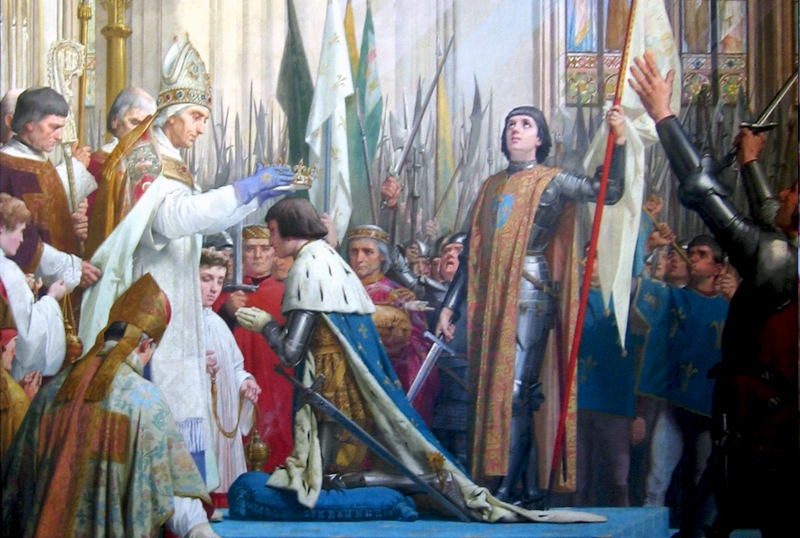 Read more about the Coronation of the Kings of France. With a Rayonnant Gothic style façade that covers a considerable area, an interior elevation defined by its soaring heights and narrow dimensions, the richness of its sculptural work and the quality of workmanship in the materials used, Reims Cathedral features amongst the most beautiful examples of gothic art still standing. Its construction, which probably began in 1211 and would have taken three centuries, will never be completed (with spires which were intended to surpass the height of the towers). The façade, inspired by the previous cathedrals of Noyon, Paris or Laon, was radically modified in the 1250s, most likely due to the arrival of a new generation of builders. The Gothic style of the cathedral evolved into a Rayonnant Gothic style of impressive size. 1. The three central portals are surrounded by two niches. The tympana of the three portals are occupied by rose windows. The sculpted decorations are therefore found in the gables, arches and splays. 2. Above the central portal, a Rayonnant great rose window topped by a broken arch is subdivided at the centre by the point of the portal’s gable. On both sides of the rose window, you can find ornamental blind arcades topped by mitre arches. The buttresses are decorated with niches housing statues. The ones that frame the rose window portray Mary Magdalene on the right and Christ the Pilgrim on the left. The latter statue is related to two other smaller ones which are just located on the edge of the rose window: they represent the Pilgrims at Emmaus. To the left of the façade, the west facing statue shows St. John, while the north facing statue is of St. Thomas. To the right, St. Peter faces St. John while St. Paul faces St. Thomas. Above the rose window, one can make out the eroded depiction of David and Goliath. 3. The upper level is called the Gallery of Kings. Here, the statues of kings are fixed in the niches. The central area is dedicated to the baptism of Clovis. 4. The two towers, which measure 81.5 metres high, are built on a square base and are encircled by corner turrets, evoking the towers of Laon cathedral (which was a great inspiration to the architects of Reims cathedral). The openings are covered with louvers. This portal is dedicated to the Passion of Christ. The scene wherein the true cross is discovered by St. Helen, is depicted in the small gable of the niche, just to the left of the portal. The main gable of the portal represents Christ crucified between the Virgin and Saint John. The arches depict scenes from the life of Christ. From left to right are the stories of: Jesus in the temple; the Temptation of Christ and Christ Entering Jerusalem; the Story of Palm Sunday accompanied by the Betrayal of Christ (the Kiss of Judas); the Sleeping Apostles; the Mount of Olives and The Hanging of Judas; Jesus carrying the Cross and the Ascension; the Pilgrims at Emmaus; Christ in Limbo; and angels. On the lintel, bas-relief carvings portray the Conversion of Saint Paul on the Road to Damascus (following on from the story shown on the south portal). The splays are occupied by statues. Going towards inside, you can see to the left a deacon, Saint Nicholas, Saint Helen, an angel and Saint Nicaise. The last statue is of the famous Smiling Angel, symbol of Reims. To the right, you can see from inside moving outwards: St. Stephen, St. Paul, the Virgin, St. John the Baptist and the Bishop Saint Rigobert. The central portal is dedicated to the Virgin Mary. It is surmounted by a gable showing the Crowning of the Virgin. On the steps of her throne, six angels hold monstrances; the world appears at the Virgin’s feet, while the sun appears above the hand of Christ. The arches depict scenes from the Virgin’s life, the Tree of Jesse, kings and prophets. These arches have been the subject of many modifications over the centuries. Of the figurines featuring on the portal, only seventeen date from the 13th century on the left and twenty-three on the right. Amongst them you can see the ancestors of the Virgin Mary represented as musician kings, scenes from the earthly life of the Virgin, such as the Bethlehem nativity scene, as well as prophets, saints, angels, God revealing himself in the Burning Bush and Jesus Christ. On the left, the splays contain from inside moving outwards: a female servant, Simeon, the Virgin bringing the child to him, Joseph, a prophet and the Queen of Sheba. On the right, the Angel of the Annunciation is turned towards the Virgin of the Annunciation, followed by the Virgin of the Visitation who faces Saint Elizabeth, then by King David (or Zachariah, husband of Elizabeth) and King Solomon. On the piers, angels appear intermingled with representations of the seasons. The trumeau is decorated with the Virgin with Child. The south portal is surmounted by a gable dedicated to the Last Judgement. Christ is on his throne holding the globe of the world, while at his side angels carry the Instruments of the Passion. In the arches, Saint John appears writing the Book of Revelation, followed by a variety of angels and demons. One can make out angels sounding the trumpets of the Apocalypse along with Saint Michael slaying the dragon. On the small gable of the niche, just to the right of the portal, you can see the lamb opening the book with the seven seals. To the left, the splays house, from inside moving outwards, an apostle, a prophet, a pope (Saint Calixte), an apostle and a bishop. To the right they contain Simeon, Saint John the Baptist, Isaiah, Moses, Abraham about to sacrifice his son, and finally Aaron. The left pier is dedicated to the capital sins on the outside and to the virtues on the inside. To the right, the seasons face the capital sins and the vices oppose the virtues. The lintel is similar to the one of the north portal in that it represents the Conversion of St. Paul. In 1861, the priest Tourneur counted more than 2,300 statues on the monument, which makes Notre-Dame de Reims the cathedral with the most sculptures in France. The building is distinguished by a rare united style despite a construction which spanned over more than two hundred years (mainly in the 13th century). In addition to the statue of the Smiling Angel, you can also admire the famous “Gallery of Kings” on the façade. Located at 45 metres above the ground, it was created to appreciate the statues from ground level. You can observe several chimeras similar to those of Viollet-le-Duc on Notre-Dame de Paris, at the chevet of the cathedral. For the Christian religion, these mythical animals had duty to keep away evil outside the churches. These guardians thus had to compete with the worse devils in regards to their appearance. 88 gargoyles were also counted in the entire Reims Cathedral and were mainly used to drain off rainwater. 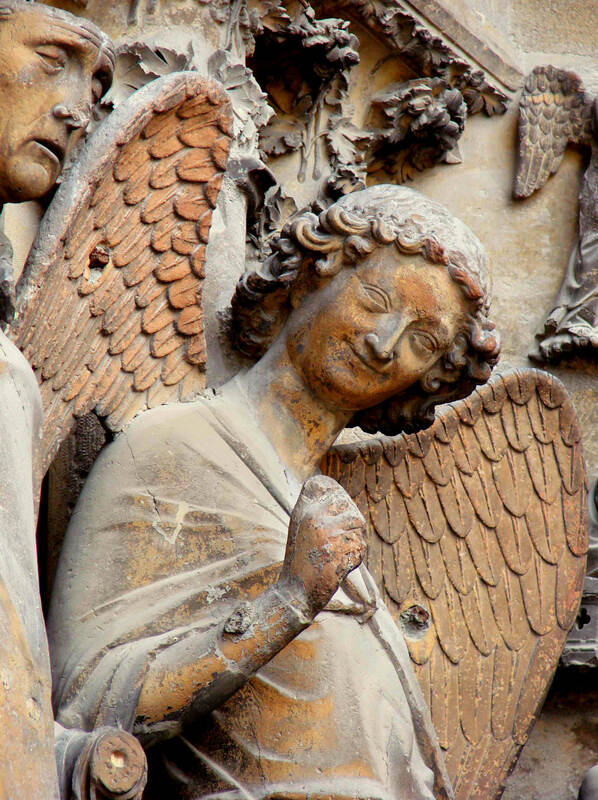 The Smiling Angel has become the symbol of the martyred cathedral during the First World War, then the symbol of the whole city of Reims. This statue of the north portal was decapitated by a burning scaffolding beam, during the fire of September 19, 1914. In the newspapers, this statue became the “Smile of Reims” or “Smiling Angel”, a symbol of French engineering and heritage destroyed by German bombs. From original fragments and a casting preserved at the museum of French monuments (former Palais du Trocadéro), this famous figure was reconstructed after the war and was returned to its place on February 13, 1926. Along the nave, the piers of the flying buttresses contain two niches housing angel statues topped by pinnacles. At the chevet, the double flying buttresses also contain niches housing statues that represent angels. You can also find these statues on both sides of the nave. You will come across another group of statues at the chevet level: Christ and eleven angels carrying liturgical objects, at the top of the buttresses of the Rayonnant chapels. These statues are among the oldest of the cathedral. The angel bell tower which dominates the chevet stands 87 metres high. 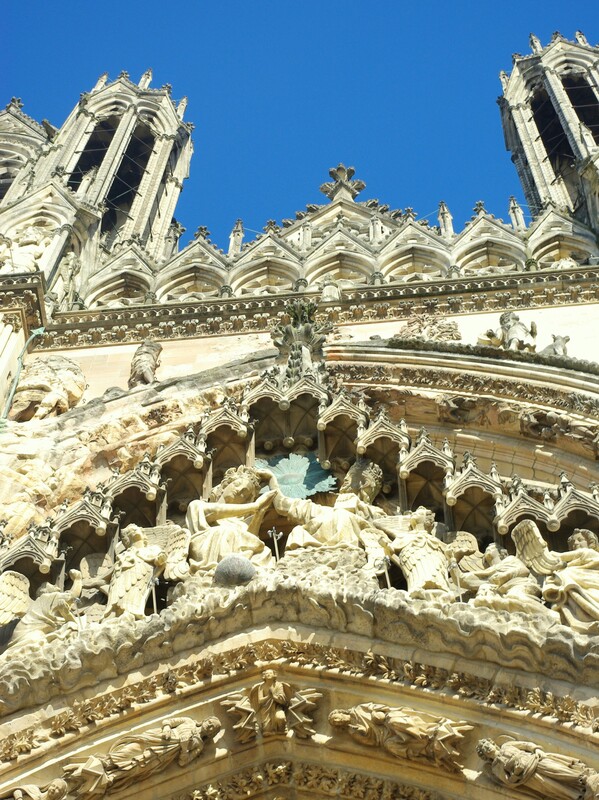 It is the highest point of Reims Cathedral. The main nave, consisting of ten bays, is flanked by two single aisles on both sides. 115 meters long, it has a three-storey elevation which is a classic example of the 13th century French Gothic style, in its most balanced form and which was inspired by Chartres cathedral. The vault of the locked great nave is 37.95 metres high, lower than that of Amiens and Metz Cathedrals. Consisting of plant sculptures and fifty-two characters (genealogy Christ and Advent characters), it constitutes a true triumphal arch for the king leaving the cathedral after his coronation. Unrivalled to any other cathedrals, this splendid carved wall is surmounted, on both sides of the small rose window of the tympanum, by the triforium gallery with stained glass, then by the great eastern rose window. Episodes of Mary’s life are depicted in the niches to the left of the portal while those of Jean the Baptist are portrayed to the right. The first niche shows a reproduction of Melchisedech, a high priest and King of Salem, offering bread and wine to Abraham who comes back from the war. Similar but less well maintained sculpted groups can be seen around the doors of the aisles. A labyrinth, dating from the end of the 16th century, existed on the floor of the cathedral. At the centre was an octagon with a representation of the master builder of the labyrinth. The four main architects were represented on the sides: Jean le Loup, Jean d’Orbais, Gaucher de Reims and Bernard de Soissons. This labyrinth was destroyed in 1779. Today its graphic representation at a 45 degree angle is used as a logo to designate a French work which has been listed or registered as a historical monument. The two arms of the transepts each consist of two bays and have double aisles. The four pillars which determine the crossing of the transept are of considerable thickness in order to support a large central tower, like the one of Rouen Cathedral. The wall of the north arm transept is largely hidden by the organ. The rose window represents the phases of the Creation. The wall of the south arm transept is divided into three levels: a set of three lancet windows, then three oculi surmounted by a semi-circular arch and finally a rose window organised around a Christ in Majesty. The choir of the cathedral consists of three right bays of unequal width. In order to keep the high altar at the location where it was formerly placed in the Carolingian Cathedral, the choir has been extended and covers the area of some bays of the nave. The right bays are surrounded by double aisles. The elevation consists of three levels: large archways – triforium – high windows. The ambulatory extends the first aisle of the nave and opens onto five Rayonnant chapels. Despite successive destructions in the 18th century, the cathedral still has many 13th century stained glass windows, grouped in the upper parts of the nave, choir and transept. On the reverse side of the great western portal, the Great Rose Window, dating from the end of the 13th century, represents “the Crowning of the Virgin” surrounded by musician angels, prophets and kings. All the 13th century stained glass windows of the choir and nave still consist of a considerable surface comprising old parts. The 13th century North Great Rose Window of the transept represents “The Creation of the World”: around God, the Eternal Father, the story of Adam and Eve, surrounded by all types of birds, fish and animals. Since the end of the First World War, contemporary stained glass windows have been integrated into the cathedral. 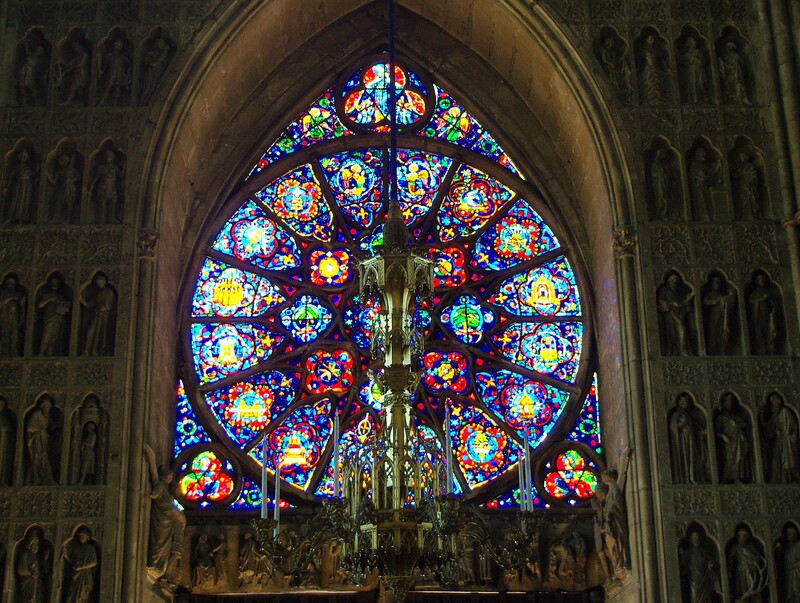 Some examples were: in the 1930s, small rose window of the western façade’s central portal and windows of the side portals, rose window of the south transept arm; in 1950, stained glass window of Champagne; and in the 1960 and 1970 decades. After a long break which lasted several decades, this trend resumes with the inauguration of a new stained glass window, planned for 2011, which is the 800th anniversary of the cathedral. 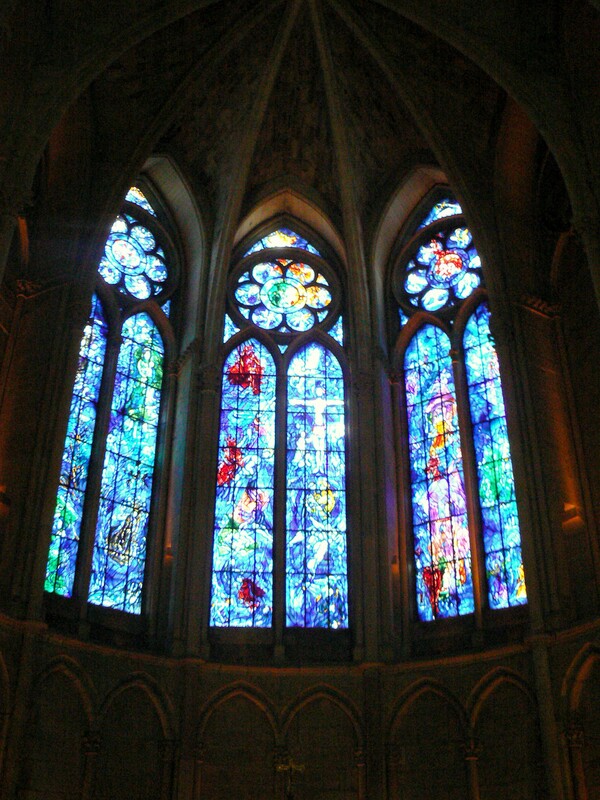 As in Metz Cathedral, the most famous contemporary stained glass windows are due to the artist Marc Chagall. In 1974, he designed three windows located in the axial chapel: the Tree of Jesse, the two testaments and the finest hours of Reims.